That brought to mind this post, originally written after a trip to Mexico in 2011. It’s a good reminder for those who have been following us a while, and a good introduction into our general nutrition philosophy for those new to the Whole9. Enjoy. *For more on how we balance healthy eating with worth-it indulgences, re-read the “Life After Your Whole30” chapter in It Starts With Food. Or read this. Or this. Or this. Or this. Because we’ve written about balancing healthy eating with special, delicious, worth-it foods so. many. times. We felt like this was an interesting subject for a post, given it’s not the first time this has come up. (We once admitted consuming some Nutella-stuffed French toast to a workshop crowd. The looks of shock and horror on our audience’s faces made us wonder if we actually said we ate a deep-fried kitten for breakfast.) The question is, does our standing as leaders in this community mean we have to be Food Robots, never eating off plan (or worse, doing it but never admitting it in public)? Some may say we’re hypocritical for advocating the values of the Whole30 while eating the occasional corn tortilla or piece of French toast. We’d like to think we’re simply human, and doing a good job of actually practicing what we preach. So how DO you feel when you “catch” your nutrition educators eating less-than-healthy foods? For those who are new to the site, it might be easy to believe that we are, in fact, food robots. The Whole30 program has been described as “militant” (among other things), and we understand it’s far more strict than a general Paleo or Primal approach. But please, do not confuse the Whole30 with living a Whole9 life. The Whole30 is a short term (30 day) program. It’s designed to be a nutritional “reset” to help people get their metabolisms back on track, banish their sugar demons back into the darkness, and figure out the way the food they are eating is actually affecting them. But please note–it’s the Whole30, not the Whole365. And while there have been folks who have taken their program out an extra month or two, we don’t encourage anyone to stick with the Whole30 forever, and we don’t live Whole30 all the time, either. Even if you haven’t read everything we’ve ever written (we’ve written a lot), it would be hard for you to miss the parts where we encourage you to take your Whole30 lessons out into the real world and create your own healthy, happy, sustainable lifestyle. That’s right–we think you should indulge from time to time! 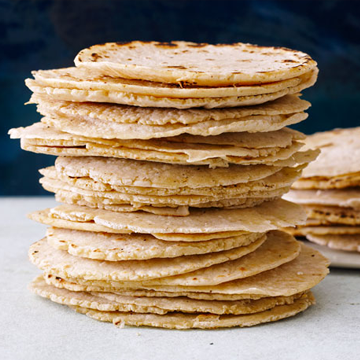 Constantly passing up Mom’s Christmas chocolate chip cookies, your own wedding cake, or a fresh, hand-made corn tortilla in Mexico because you’re trying to eat perfectly doesn’t sound very happy, balanced, or sustainable to us. On the other hand, hoovering every sweet treat you come across doesn’t sound very healthy, either. We believe there is a perfect middle ground, which leans way to the side of healthy while still allowing you to enjoy the foods you really, truly love. And we have dedicated so much time and energy on the blog, in It Starts With Food, on our Whole30 forum, and in our seminars to helping you figure out what that looks like for you. Here’s what we think is the most awesome thing about our program: We don’t decide for you what food may or may not be “worth it.” In addition, understand that “worth it” has nothing to do with how “bad” the food may be. You, as big boys and girls, get to do your nutritional off-roading all on your own. If corn tortillas or French toast aren’t your thing, then skip ’em. If your favorite food in the whole world is dark chocolate or hummus, then that becomes your indulgence. If you prefer tequila shots or a McDonald’s cheeseburger and fries, then those are your things. We’re not here to tell you whether a food is worth it, or that it’s “too unhealthy” of a treat to even consider eating. We just try to provide guidelines for helping you determine how, when, why and how often to indule, and when you should just take a pass. And isn’t that the way it should be? So here is our position, in a nutshell. Do the Whole30 a few times a year to push your nutritional “reset” button. Follow our helpful guidelines for nutritional off-roading and make your own educated, informed decisions about incorporating less-than-healthy foods based on what you’ve learned from your Whole30 experiences. And continue to refine your own “worth it” determinations as you expand your knowledge of your own healthy eating habits. So, based on the above, what do you think? Are your nutrition role models hypocritical for not upholding their strictest standards 365 days a year… or are we simply human, enjoying all the benefits of our own Good Food programs in a happy, healthy, sustainable fashion? Discuss. 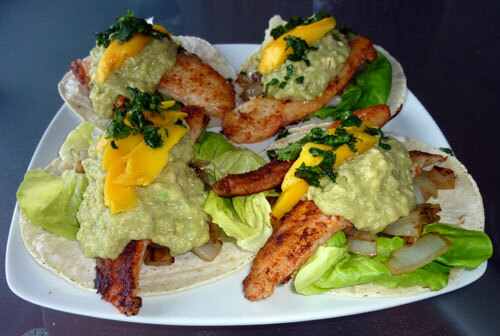 The controversial fish tacos. Mmmmm. And really, handmade corn tortillas are cheating? Even once in a while? The people who think so have an unhealthy relationship with food. Thank you, Melissa and Dallas, for being human. Whole30 has changed my life in so many positive ways. I suffered from horrible acid reflux and heard from doctors to go low fat and low acid. One Whole30 showed me that it was grains, even “healthy” ones, causing the distress. Several Whole30s later, and I’ve confirmed that fact and developed a much stronger view of food. I think if you’ve read ISWF then you would not at all be surprised by a mention of eating off plan. I love that all the info is on the website for people to use but I really encourage friends to read the book because of things like this. One thing for me is that I’ve done three Whole30’s now and I am still surprised by how a single ‘offroad’ choice that seems to be worth the consequences can roll itself out to be a week or more of my making similar bad choices. So, in that regards I do hold you (M & D) up in my mind as ‘role models’ but never hypocritical ones. I think it’s ok for people to go of plan every once in a while, if they can handle the consequences. Personally, I view what people would call “cheat” foods as part of a long-time addiction. To me, they are a drug, the drug that put me at some of the lowest points of my life. And just like an addict can’t just have a “bump” or “swig”, that one bite can, and likely would, send me spiraling out of control, just as it inevitably has in the past. I tried everything humanly possible to get this under control, and Whole 30 has been the ONLY thing that has worked for me to kick the cravings. For some people, having a “cheat” is ok (and that’s awesome! ), but knowing my own propensity toward food addiction, I have to stay away from it. I think I fall into the same camp as Rosie. I traded my nicotine addiction with a food addiction and for me to be healthy I have to go the same way as I did when I quit smoking. No off plan food. Having said that I think that Dallas and Melissa have the right attitude. Balance is the goal and when I achieve it I will finally be free of my addiction. Until then I need to stay totally away from the foods that bring me down. I love this post. This weekend, my sister and niece were visiting me…I was worried, but I ate surprisingly well when they were here. However, on Saturday afternoon, the three of us split an ice cream sandwich from a food truck at a park. It was mint chip ice cream made with real mint. And it was FABULOUS. When my sister and I finished our portions (admittedly smaller than my niece’s–darn that 8 year old metabolism! ), we both looked at each other and my sister said, “THAT is exactly what Melissa and Dallas are talking about. That was worth it.” And I totally agreed. For people who have read the book and the website, you guys are modeling exactly what you preach. Fresh corn tortillas while vacationing in Mexico? Uh, yeah! Pasta while in Italy? Yup. My Mom’s perfect, once a year, completely un-substitutable apple galette? Most definitely. “Deal with the consequences” just means “be prepared for how your body may react and don’t schedule a half marathon/photo shoot/boat trip with no bathroom the next day,” not that you should feel bad about anything, and the book and the blog make this perfectly clear. Frankly, I’d find it a lot harder to relate to you guys if you placed optimum physical health over culture, enjoyment, family, etc. 100% of the time. Your philosophy is actually sustainable, for life. Thank you, Melissa and Dallas. Exactly what I needed. It’s very refreshing to know you practice what you preach (in the book, online, etc). I would feel so much less at ease with this program if I knew you preached that you guys lived spot on, 100% all the time (or like you say, worse – lied about being 100% all the time). Knowing we’re all human and we classifying these indulgences under what is important for us makes all the sense in the world. Cheers! Great post. I hate the word “cheat” and the idea of cheat foods, cheat meals, and (especially) cheat days. I don’t indulge in that kind of thinking. I have done three Whole 30s and I have learned something valuable from each one. I can’t do grains at all without having inflammation issues, so I know not to eat grains or I will suffer the consequences. I can’t do sugar in liquid form, so no sodas or other sweetened drinks without a Sugar Monkey on my back. But I know what happens and I can make an informed decision. I usually choose not to go off-road. But sometimes it’s worth it, and I’m an adult. Thank you so much for consistently and repeatedly reminding people it is NOT the Whole 365 and that the occasional indulgence isn’t the end of the world. I love this post! Just today, I finally got a message from my SIL who asked about our family’s food choices and what can she read to get started. Of course, I said ISWF! The longer I eat this way, the more I learn it’s a very individual journey and I can’t wait for my SIL and her family find what works for them. I’d love to eat a fish taco with a real tortilla but it’s just not worth it to me and so I make a different choice. I hope everyone who begins this journey ends it with the knowledge of what makes them feels the best and leave everyone else to find their own path. Good for you!! 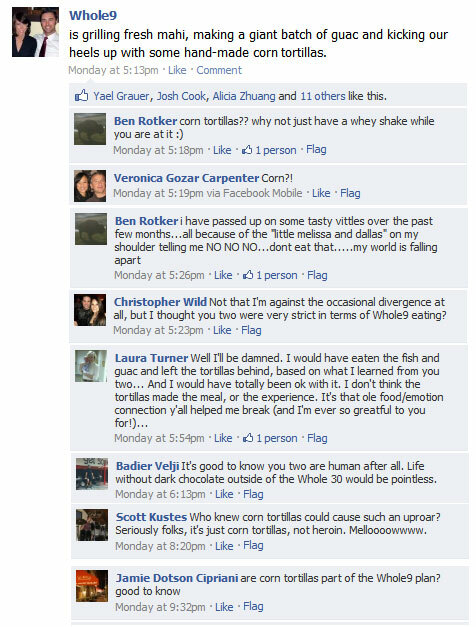 I’m so glad that you are all getting what we are throwing down in terms of living a sustainable, balanced Whole9 life! Personally, I really needed this today. I have spent years battling a severely unhealthy relationship with food. Emotionally I get so hung up on “never again” and “always” that I forget that being human is ok. I set myself up to fail because I decide to indulge and get lost in the “well, I already failed today, I might as well start again tomorrow” mindset. When that happens, I forget the things that are really important. Overall well-being and truly rebuilding my relationship with food. Thanks guys, for being human, and reminding me on this difficult day that it’s ok to BE human. I won’t start again tomorrow. I’ll start again now. I think your “cheat” is completely consistent with what you lay out in ISWF. You also talk about there being a difference makin your cheat corn tortillas or quinoa vs a tub of ice cream (excessive and unhealthy) or a bag of pretzels in the break room. If you expect complete perfection from yourself or others you’re just setting yourself up to be angry and disappointed.